Recently I have changed a few screens on iPhones, iPods and iPads, I have even got the wife doing them for friends and family. The idea was to look at starting this up as an additional service that the business could provide as well as just consultancy. Part of my research has required finding good parts at cheap prices, after a little bit of googling I quickly came across www.alibaba.com. The best way I can think of to describe the Ali Ba Ba website is "Amazon for Chinese manufacturers". There is literally tons of stuff up there that is all manufactured in China and sold at cheap prices, you can buy everything from Light bulbs to ride on electric cars for kids! My only recommendation is don't make out your interested in anything unless you really (really, really, really) want it. I get 2-3 mails a week offering me LED light bulbs from a girl called "Lucy Wu" that will not give up, her emails do provide a bit of light humor as she often tells some round the houses funny story about what she has been up to that week before asking if I want to buy "the best light bulbs in the world". After a bit of searching around on "Ali Ba Ba" I found nearly all the standard parts you would expect, the typical ones you can find on ebay and amazon such as replacement screens, cameras, batteries, dock connectors etc. I dismissed it at first and thought that will never work, they will be fakes. Having ordered a few lcd screens and striking up a bit of a relationship with a supplier I decided to ask if they did the logic boards for devices and were they genuine, would they actually work? After a Skype chat the supplier assured me they would work and they were genuine and unlocked. 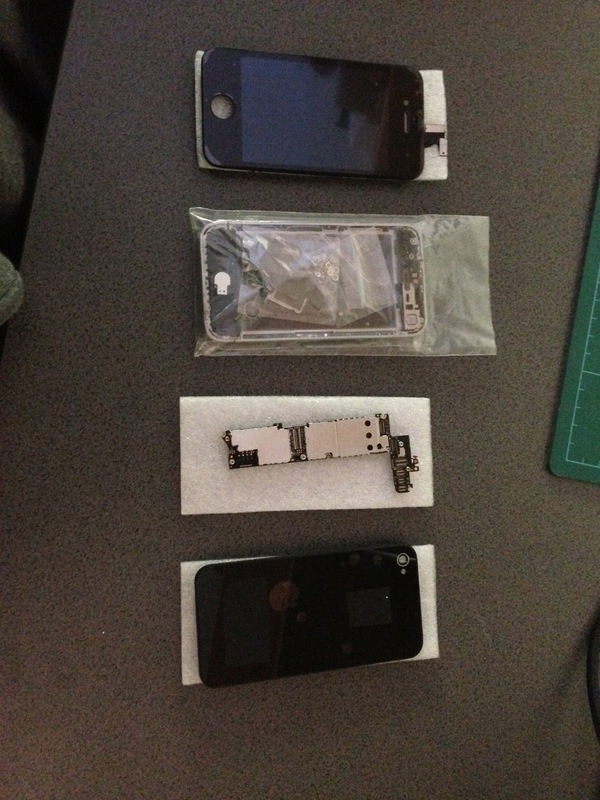 The price of the boards vary but for a iPhone 4 16GB I was lookign at approx £150. Not a good price, but curiosity got the better of me and I decided to look for all the parts I would need to build a device from the ground up. I dropped a message to the supplier I had been using and asked them if they could supply 1 x all of the 23 items listed. Sure, they would go away and find out what was required. 24hrs later they came back with a list and a price for all the items, "how many did I want?". I have to stress, I just wanted to do this as an experiment, this wasn't designed to make me any money, in fact it made me a loss, I could buy a 2nd hand iPhone from ebay a lot cheaper. I wanted to know if I could find all the parts, could I actually build my own iPhone, thats what we used to do with PCs right?!?! I ordered the items I needed and 4-5 days later a courrier dropped the package to my door with all the items. Now this wasn't exactly the unboxing experience you get when you purchase a nice new phone, I should have probably made a video of it and posted that up but I only took some pictures, here is what I got. 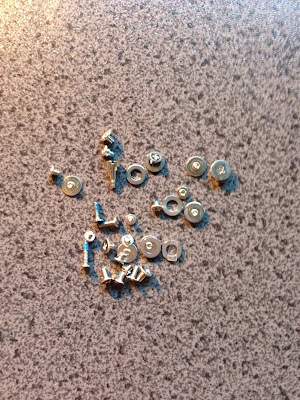 Also included was a bag of screws, of which I had a rough idea what went where but a lot of this was going to be guess work. 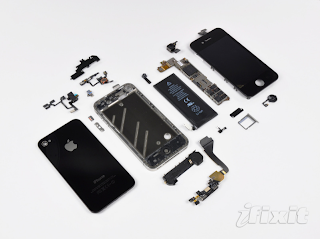 I had a quick look at a video from Direct Fix on how to change an LCD screen on the iPhone 4 to give me an idea of what would go where. After about an 1hr I had everything in place and it was the moment of truth... boot up. This is where I hit problems, I could make a call and receive a call ok but didn't hear anything out of the ear speaker, and the mic didn't seem to work. Maybe I had missed something so stripped the device down and the reassembled again, same outcome no sound and no mic. I had a spare iPhone 4 so I took the logic board out of it and swapped them over, with an original Apple logic board the new parts all worked no problem. I put the new logic board back into the new device and booted up again, but this time the LCD wasn't displaying... arrgghh!! 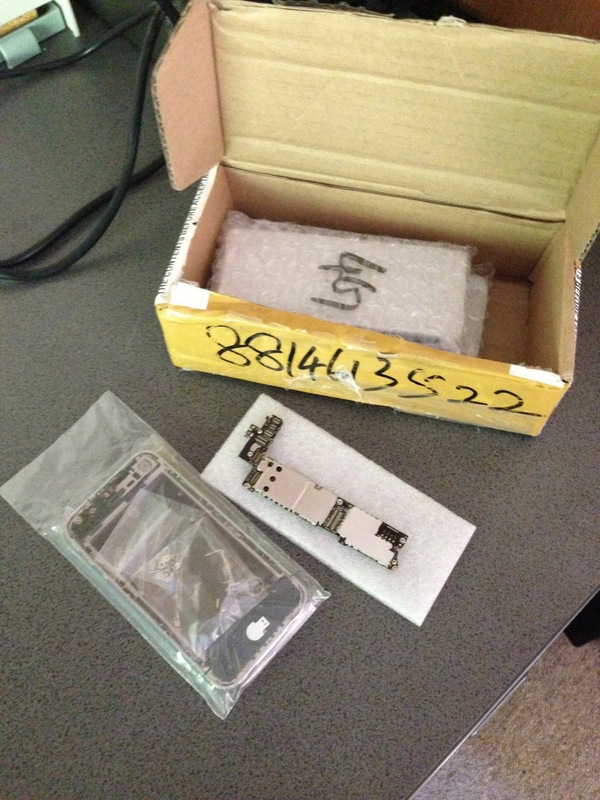 After much "faffing" around stripping and assembling the two devices I came to the conclusion that the new logic board was in fact faulty so sent it back to the supplier in China. I'm guessing they may have acquired them because they are faulty or not quite up to scratch, who knows. Once the supplier received the board back they sent to there QA team to test and check if it was faulty. I was kind of expecting the response I got back "Yeah it's all fine, no problems. Want us to send it back?" I was 100% sure it was faulty so asked them to send me a video of the part being tested and working, which they couldn't do. I have now requested a refund and after 4 weeks of hassling them everyday it looks like I might get the money back. I was hoping that if I got a replacement logic board back that worked I could check what it was talking to by firing it via burp proxy. It doesn't look like I'm going to get one back so this is canceled. My conclusion from all of this is Apple make money because they are good at this and they make great devices (IMO)! The amount of engineering that goes into getting so many small parts into a device is amazing, maximum respect to the people who do this for a living (including Samsung, BlackBerry et al). 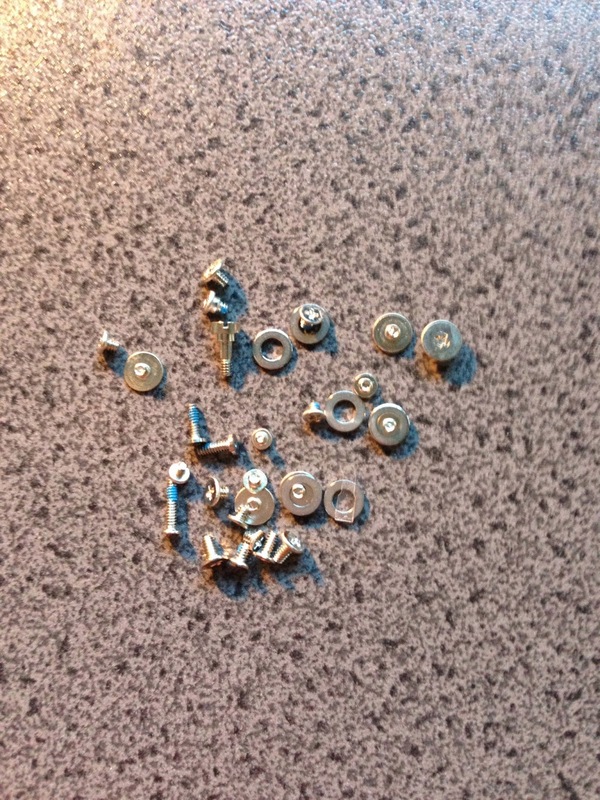 It is possible to assemble a device from parts imported from a shady Chinese supplier but it's really not worth the time, effort and chances are they will be 2nd rate parts. If you are struggling to find the money to buy one, check ebay for a damaged device and replace the bits that are damaged. Now I have a few spare devices I would love to try and do some "chip off" type forensics... I am expecting a lot of collateral damage doing that and at the moment have no idea where to start!